Hello Sin City Stampers! 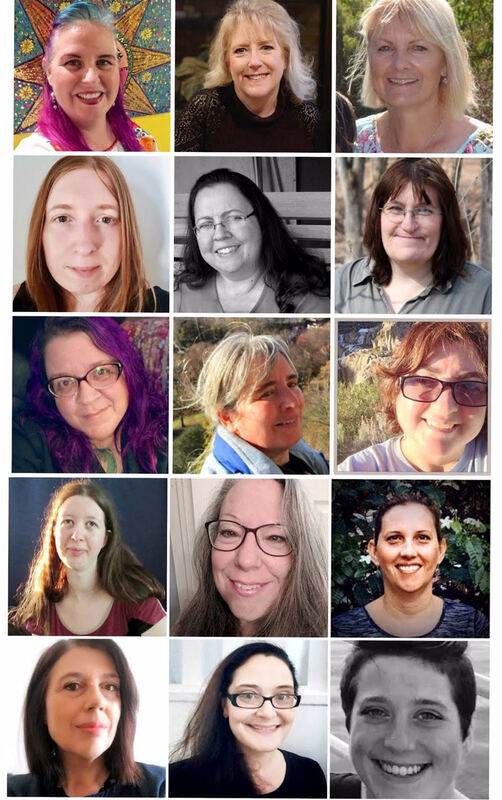 My name is Robin Redd and I’m part of the new design team at Sin City Stamps! This month we are collaborating with Frog Dog Studio! 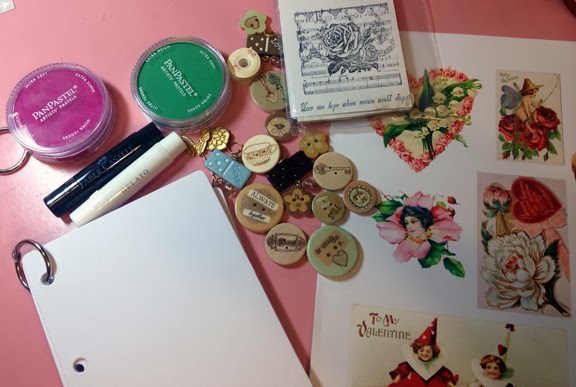 This is the Frog Dog Studio kit for February which includes the beautiful Romantic Background Stamp and a saying “Love Can Hope” stamp that says, “Love can hope where reason would despair”, which is a quote from George, Lord Lyttleto. I decided to make a minialbum of the first card my boyfriend made. 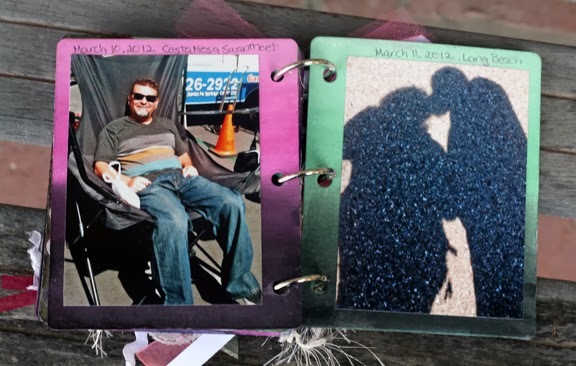 He made a lovely, detailed, layered Valentine’s Day Card. 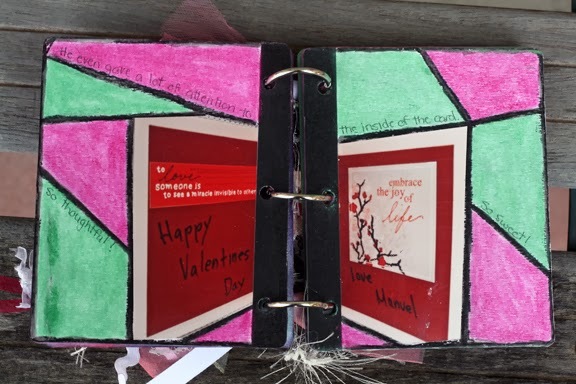 The cover shows the Vintage Valentine’s Backgroundstamp which I white embossed portions of in the corners of the cover, over Pan Pastels and chalkboard paint. 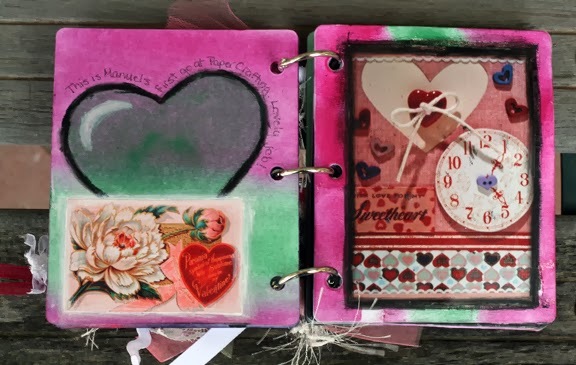 I, then, decoupaged the heart ephemera off-centered onto the front of the book. 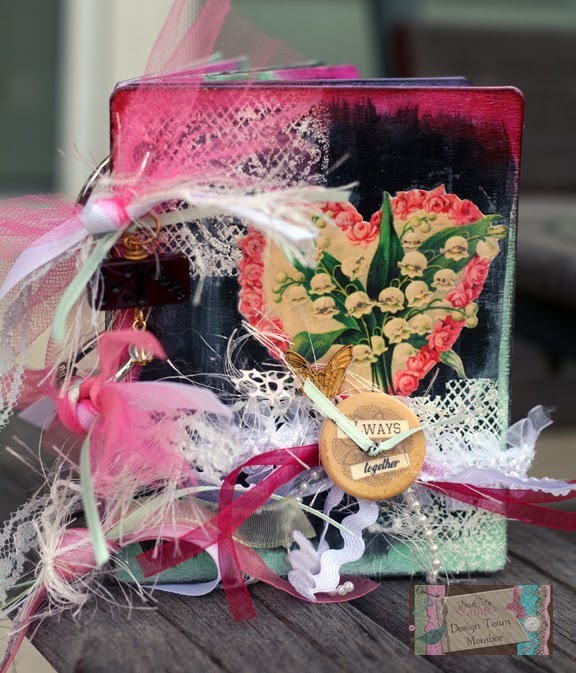 Once the book was complete I added a junque-bow ribbon tied with one of the Prima Wood Buttons included in the kit and stuck a metal PrimaStick Pin through the knot. 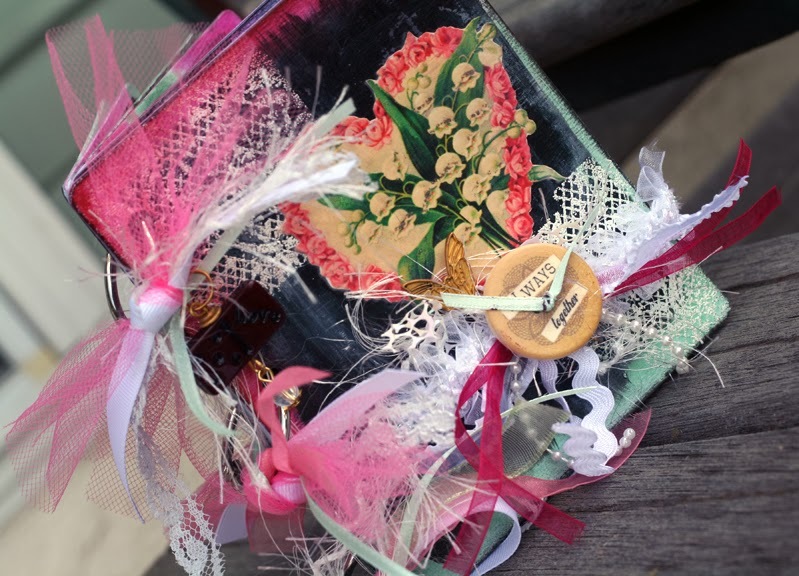 I tied more ribbons and fibers to the binderrings of the book and attached one of the Prima Love Domino charms so it will dangle. 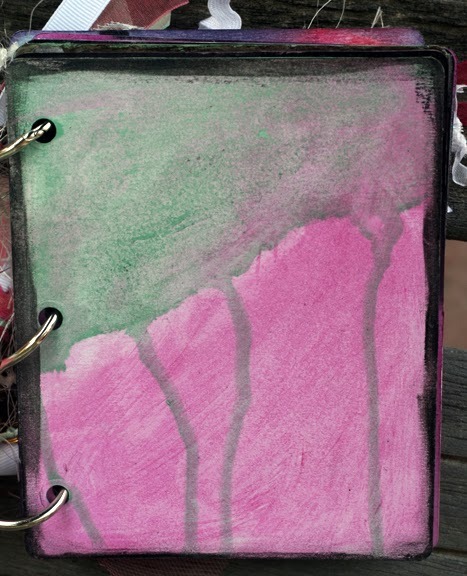 The first page was covered with Pan Pastels. 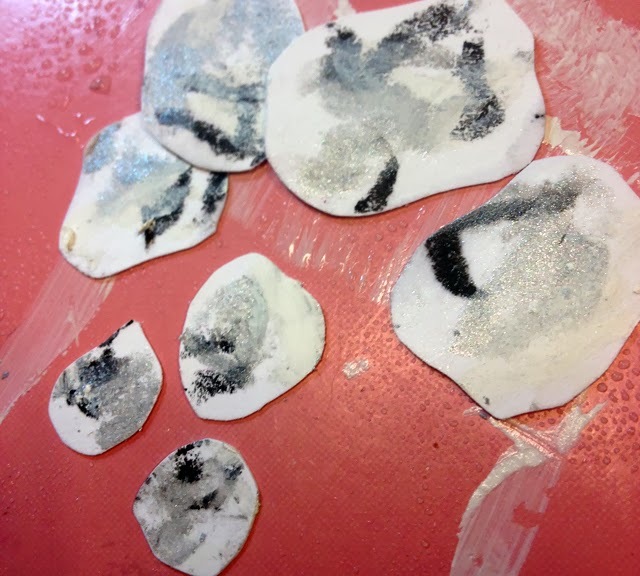 I layered the white and black Gelatos through a stencil and stamped the RomanticBackground Stamp in black ink. I adhered a piece of the ephemera and topped it with a Prima Wood Button tied with the Antique Spooled thread. 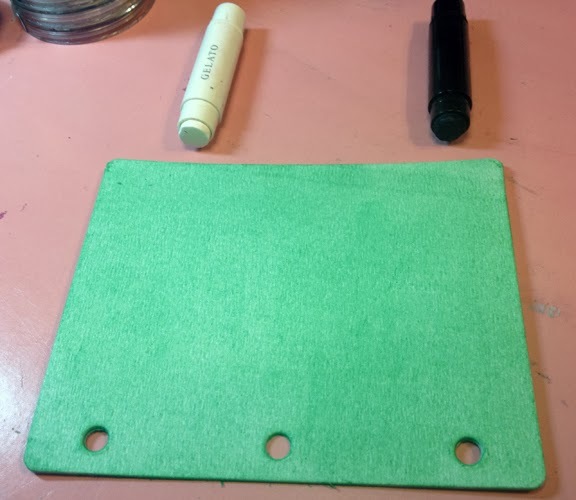 I used the Pan Pastels to cover the back of the next two pages. On page 3, I layered a heart stencil with Permanent Green Pan Pastel, outlined it with the Black Gelato and highlighted the heart with the white Gelato. Again, I layered another piece of the ephemera, outlining it with the White Gelato and spreading the gelato out with my finger. On page 4, I outlined a picture of the front of the Valentine’s Day card my boyfriend made me with the black Gelato, spreading the Gelato with my finger. 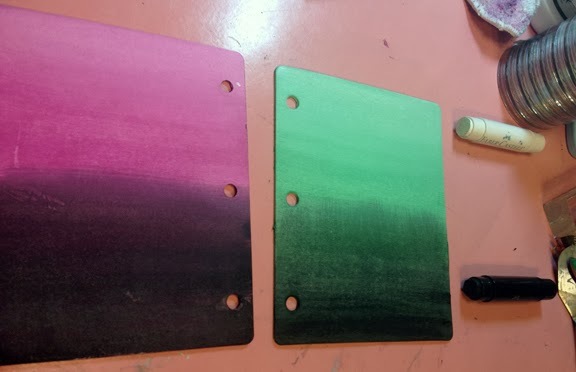 After adhering a picture of the inside of the card to pages 5 & 6, I made a mosaic with the black Gelato and colored each space in with the Magenta and Permanent Green Pan Pastel. On page 7, my favorite part of the entire book, was ‘making a rock walkway”. I free-hand cut rock shapes from white cardstock. I dabbed black, white and silver Gelato on each ‘rock’. 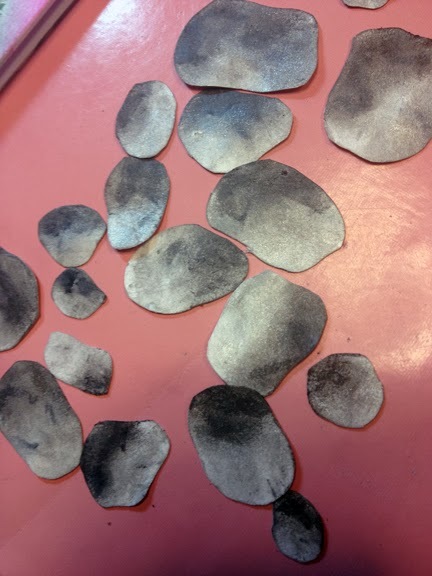 Next, I smeared the gelatos with my fingers, giving it the look of rocks. 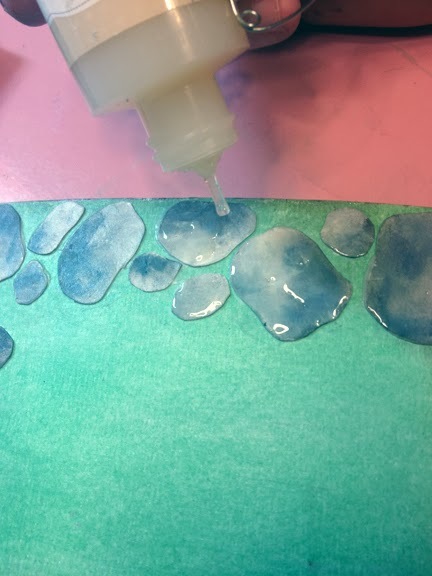 After gluing the ‘rocks’ onto my page, I covered the rocks with Liquid Glass (Close To My Heart). With a brown water-color pencil I filled the ‘rocks’ in with ‘dirt’, completing the walkway. Page 8 shows a SinCity Label die-cut painted white. 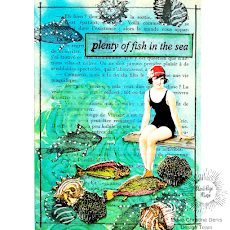 I stamped the Friends stamp with the VersaMark stamp pad, which is clear. 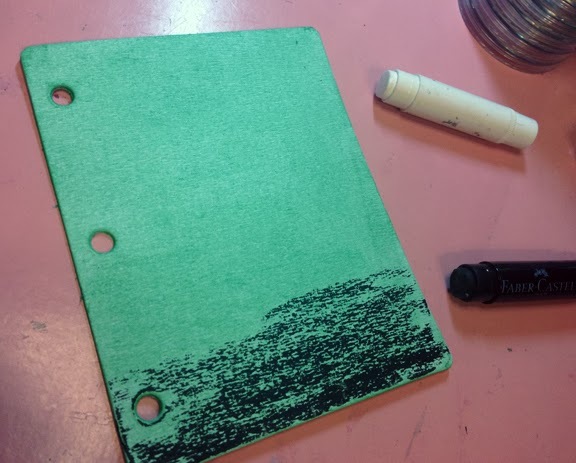 When I sponge Permanent Green PanPastel over the stamped image, the stamp image pops out! I doodled over the words on the stamp, “Friends are Forever”. 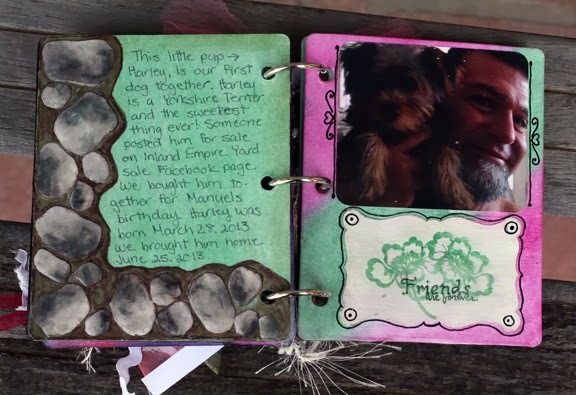 I really enjoyed making the next two pages in my mini-book. I simply spread the PanPastels over each page using the soft tools. 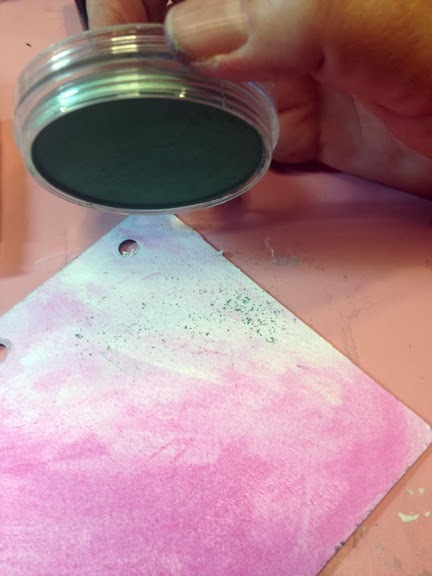 To show how you can make more colors with the product that comes with the kit, I’m sharing how to tint and shade the Permanent Green PanPastel with the Black and White Gelato. Color one end of the page with the Black Gelato and the other end of the page with White Gelato. Using a flat paint brush and water, spread the Gelato, lightening as you move the Gelato toward the center. This is how each color looks showing the varied colors. Now, it’s time to watercolor with your Pan Pastels! Simply shake some loose color from your PanPastels onto your page. 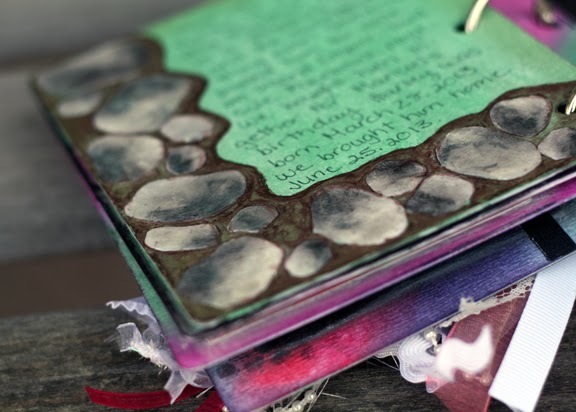 spray over page then water color your page with a paint brush. 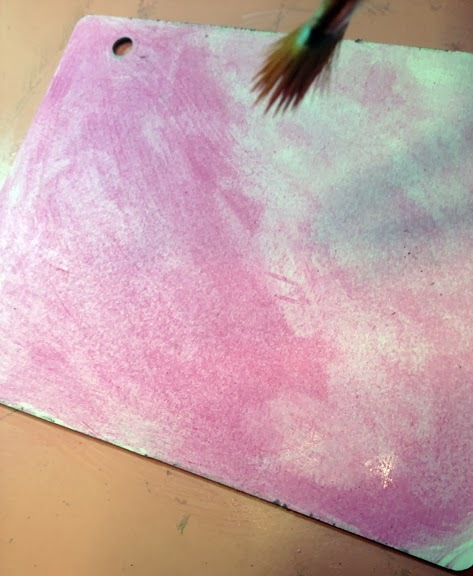 After water coloring with the Magenta Pan Pastel on part of the page, I let it dry. Then I repeated the process with the Permanent Green Pan Pastel on the other part of the page. 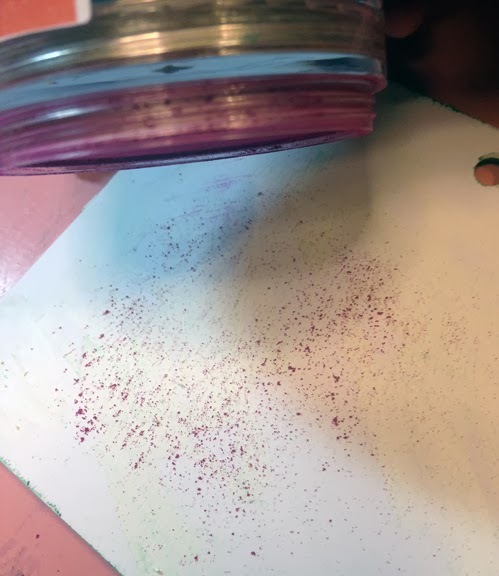 If you spray extra of the water/alcohol mixture onto your page, you can make your Pan Pastel colors drip, for yet another look on your page! **It’s important to let each layer dry before adding a different color. rather than the distinct colors you intended to show. 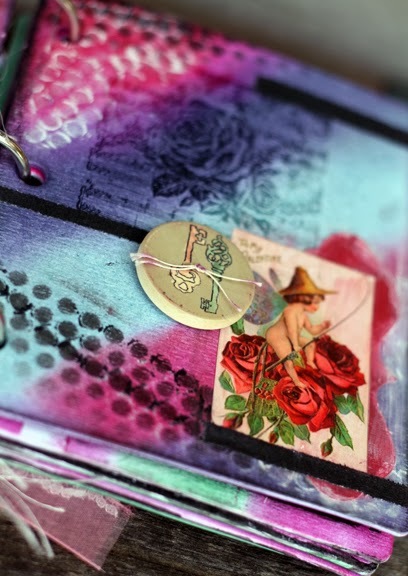 I hope you learned at least one thing new, here, for you to change up with product you already have with Sin City Stamps at Frog Dog Studiokit! I enjoyed sharing with you! Wow Great Mini Album! Love the techniques. Great Job! Great tutorial, love the mini album!